Purchase your child's dream toy with this wonderful Retro ride on brought to you by RIPX; with its rechargeable 6v battery - you can rest easy in the knowledge that your child can ride safely and smoothly while still having tonnes of fun with a maximum speed of 3km. This scooter comes fully equipt with an aux audio input, perfect for any mp3 player. This premium ride on also features fully operational lights and sounds. The comfort on this ride on toy is beyond comparison with a padded seat for comfort and manufactured with lightweight materials to enable manoeuvrability and Raised centre sections on wheels for added stability. 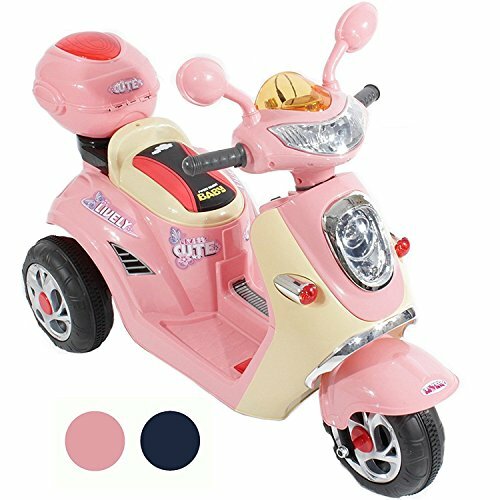 This ride on is a breeze to drive and with a Run time of up to 3 hours on one charge (depending on road condition and user weight) your child can go off on their favourite toy straight away.